Have you dived on this boat? Rate it! Looking for something different? Something relaxing in the heart of Cuba’s famous Jardines de la Reina off the coast of Cuba? Tortuga, part of the well established Avalon Fleet – may be just what you’re looking for. You can check the availability, schedule and prices for this Boat here. Said by some scientists to be one of the best preserved marine eco-systems with the largest fish populations in the Caribbean, Jardines de la Reina or Garden of the Queen is a spectacular place to dive. You’ll be greeted by enormous shoals of tropical fish and, potentially, dive with up to 6 different species of shark that are found in the area; Silky, Reef, Lemon, Black tip, Great Hammerhead and Nurse. The extraordinary preservation of this marine park is, in part, due to the small numbers allowed to experience their exclusive waters; Jardines de la Reina is only open to a maximum of 900 divers per year. 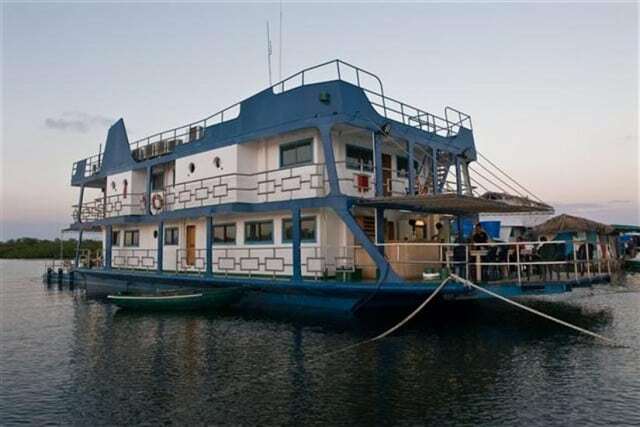 Tortuga is essentially a floating hotel or houseboat, 34m in length, constructed of steel. Floating a protected channel she is securely anchored and makes a great base for divers and non-divers alike. Limited water movement and great stability (as she is not exposed to the open ocean) means she offers a relaxing stay to all her guests. Tortuga features a total of 8 guest cabins. 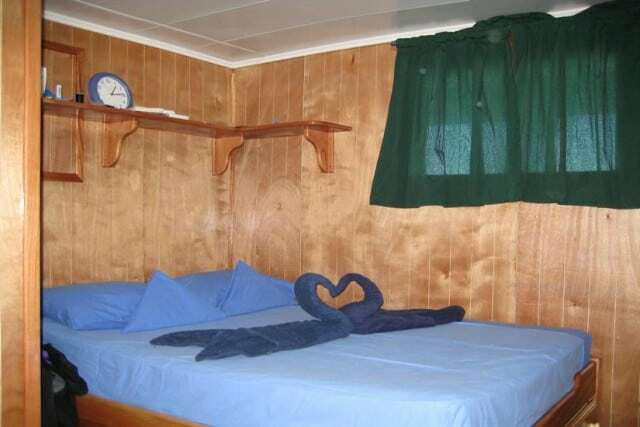 Each cabins has the potential to sleep up to 3 people. This means there is potentially space for 21 guests. 7 cabins are on the upper deck with the final cabin located on the main deck. Each has it’s own private ensuite bathroom facility with sink, toilet and hot shower. Each cabin also has it’s own air-conditioning with individual temperature control. When not in the cabin Tortuga is spacious and welcoming. 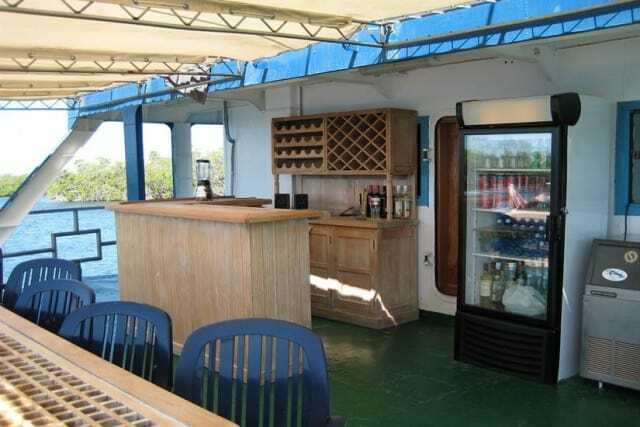 On the lower level (main deck) there is a large dining area, which is also air-conditioned. Outside there is also a large fore and aft deck with tables and chairs where you can relax, read, soak up the Cuban sunshine, or simply watch the sun set while you enjoy an appetiser, have a drink or even smoke a Cuban cigar! Also onboard, for those who wish to stay connected, is a satellite internet/wi-fi service. The boat also has 24hr power should you wish to charge your devices. Dining onboard is a mixture of European cuisine mixed with local Cuban favourites with something to suit the vast majority of palettes. Snacks, water, and a selection of beverages from fruit juices to beers and whisky are available too. Onboard Tortuga you’re able to complete 2-3 dives a day. 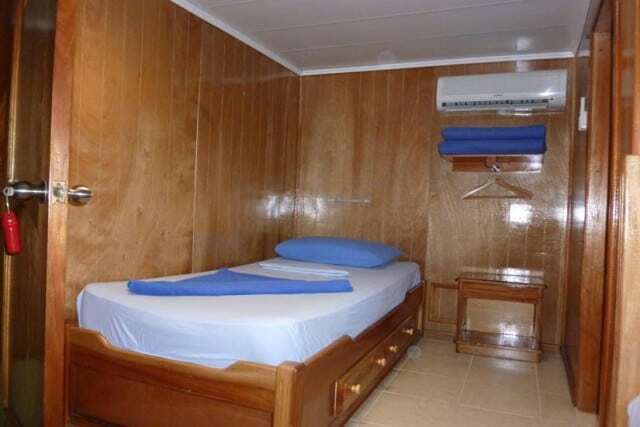 The diving schedule is flexible and to a certain extent at the discretion of you, the guest. Fast diving vessels – skiffs – are utilised to transport you to the many different sites available. Safety is key and all the expected facilities are onboard the diving vessels and there is excellent communication with the ‘mothership’. The dive staff will be on hand every step of the way to brief you on each individual dive site and the potential wildlife you may encounter. Tortuga Dining and Bar area. Photographers also have their own photography station and there is a shared PC for transferring your favourite shots. Jardines de la Reina is open 12 months a year. Typically, bookings are made for duration of 7 days/6 nights on Tortuga. Expect to budget approximately EUR2,614 for the 7 day stay. This equates to EUR373/day. However, please note that this does not include some extras including dive equipment rental (if required), crew tips etc. Please contact us for further details. Where does this liveaboard dive boat go? Check out the fabulous places where this dive boat travels to. Note: some destinations may not be listed below, please enquire for more details. The marine protection programs in Cuba has resulted in pristine coral reefs. If you have been diving on board this liveaboard dive boat in Cuba, please share your review and let us know what you thought. Please post your comments in the review section below, by doing so you will help fellow divers to plan their next diving trip . In november I was one week in the Jardines de la Reina on the liveaboard Tortuga. First I expected diving in Cuba is another victim of marketing-professionals from diving agencies, but, I was completely wrong…. Have you been on this liveaboard cruise? Rate it! Other divers will appreciate to see your feedback about this cruise! How was the boat and service on-board, the accommodation, the itinerary, and the diving? Your email address will not be published. A unique way to stay in the Jardines de la Reina marine park. Where will this boat take me to dive?